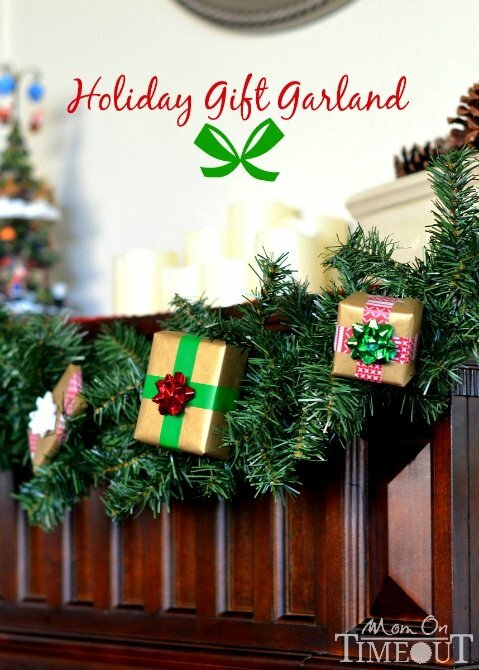 This Holiday Gift Garland is a surefire way to instantly add a festive flair to your holiday decorations! It was super easy to make and took me about 30 minutes from start to finish. I ended up wrapping a string of lights around the garland at the end and found that extra touch really went a long way. Let’s get started! 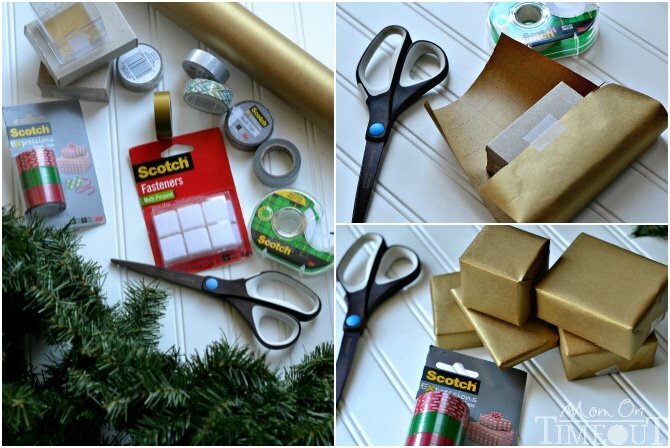 Gather all of your supplies, choosing festive Scotch Expressions Tapes for your garland. 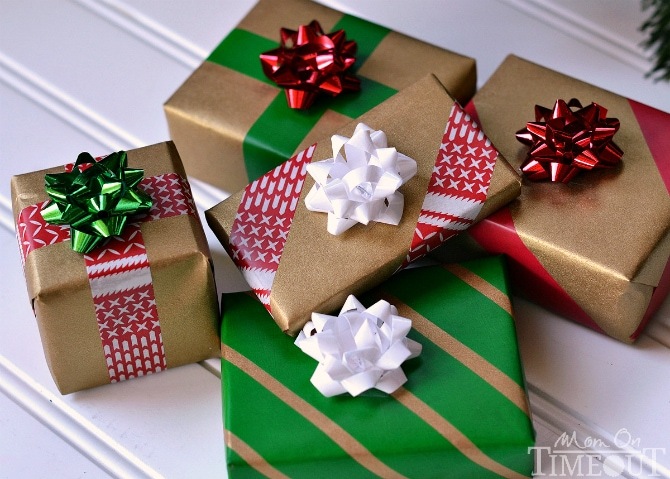 You’ll need to wrap empty boxes, which can be jewelry boxes, small craft boxes or anything less than 4″x4″. 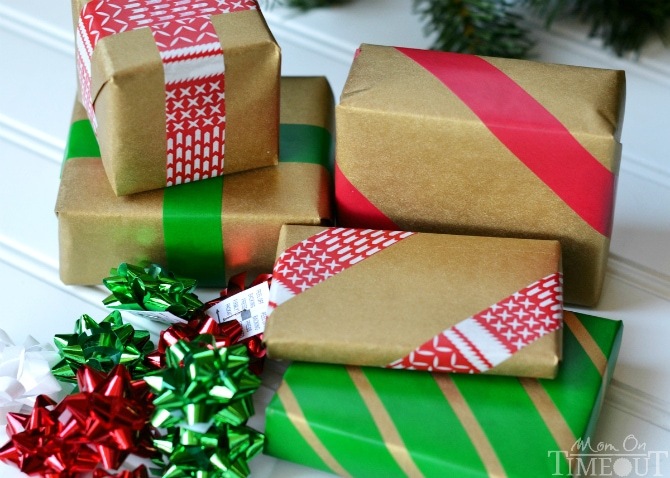 Cut pieces of kraft paper or wrapping paper the correct size for the empty boxes you’re wrapping. Make sure to securely tape each side of the box so that the paper is held in place. After all of the boxes are wrapped, embellish them with Scotch Expressions Magic Tapes. Cut strips of tape and attach to the boxes in diagonal or striped patterns; use your creativity! I chose to use Red, Stitch and Green Scotch Expressions Magic Tapes for this part of the project. 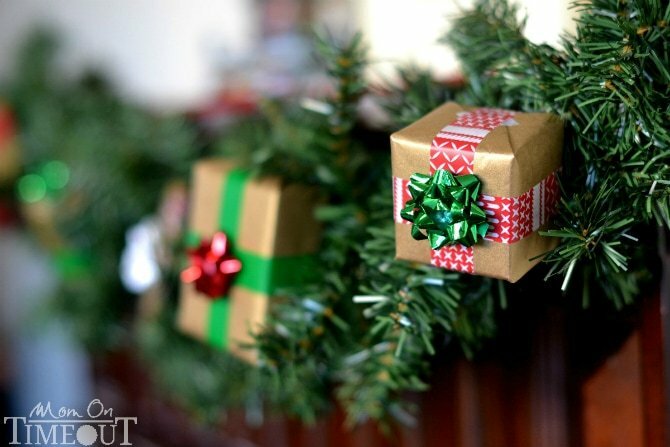 If you’d like to add an extra festive touch, attach coordinating mini bows to the tops of the wrapped boxes. I used metallic bows because they really catch the light. 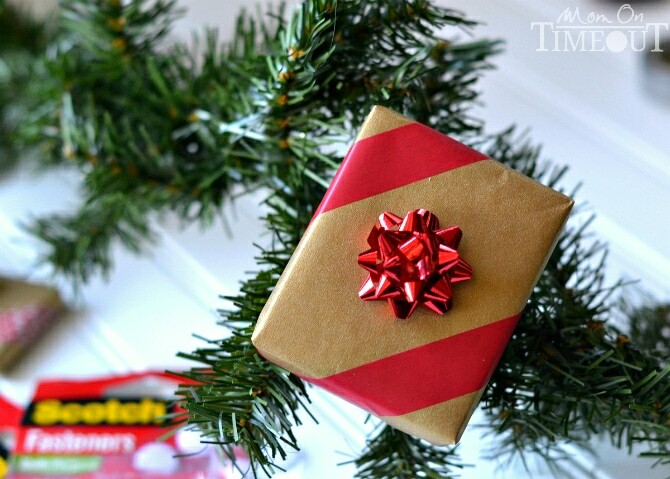 Attach Scotch Multi-Purpose Fastener Dots to the back of the presents and the garland. Follow the directions on the packaging, and space the Scotch Fasteners about 6 inches apart on the garland. 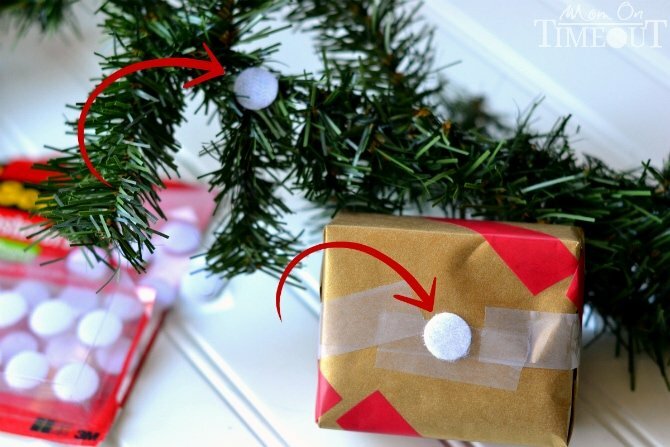 Attach the presents to the garland by connecting the two sides of the Scotch Fasteners. 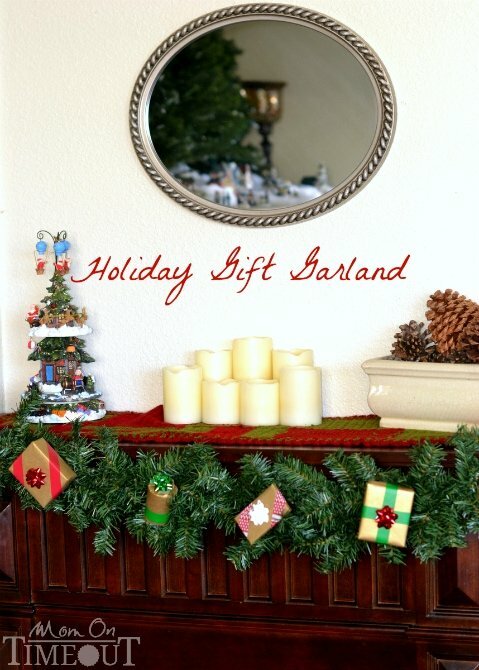 The Scotch Fasteners are great for this project because when it’s time to pack away the garland, you can easily remove the presents from the garland and the garland from the wall or mantel. 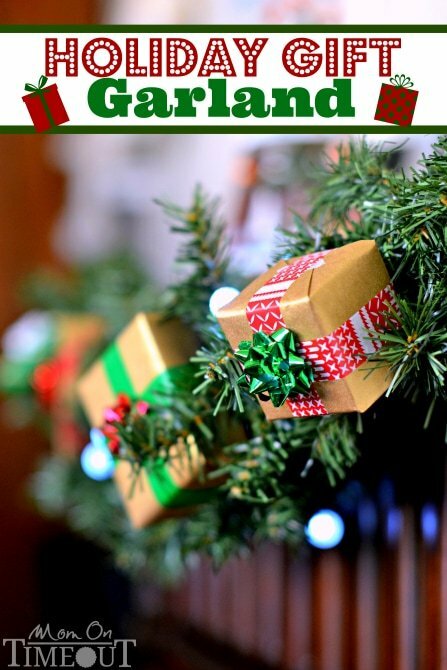 Because the Scotch Fasteners can be adjusted and removed, they allow you to adjust the presents on the garland in different ways without having to remove and reattach the garland. Choose where you’d like to hang the garland and lay it across the mantel or attach it to the wall or mantel using the Scotch Fasteners. Make any necessary adjustments and use the branches to showcase the presents. If you choose to wrap the garland with a string of lights, make sure you know where your outlets are! I had to re-wrap mine because I wasn’t paying attention 🙂 You could also make the garland an advent countdown by wrapping small gifts in Step 1. For example, you could wrap a deck of cards, small toys, jewelry, chapsticks, hair accessories, ornaments, etc. Anything that can fit into a small box would be perfect! « 62 Peppermint Recipes for Peppermint Lovers! This is so pretty and I look forward to making them. I do wish there were a “printer friendly” list of the instructions. Oh my gosh, this garland is so stinkin’ cute! Love it – I think even NOT-crafty me could do this! Oh wow, that is SO creative, Trish! I love and and definitely making it next year! Oh my goodness! That is just too cute!! And I love your idea of putting little presents in there! Trish, this is SO freakin’ adorable!!!! Oh my gosh! I want to make one right this minute! This is so cute! And I love the idea. So simple and elegant. Thanks for posting! Oh my gosh! That garland is too cute. I love the idea to put mini wrapped gifts on it. I am a sucker for garland … love this one … it’s different! Me too Brenda 🙂 Thank you! So adorable and creative! I may have to wait until next year, but I will definitely be doing this! Thanks! That’s awesome Teri – thank you!